"The Creature of Kapu Cave," the 15th episode in the popular Nancy Drew graphical adventure game series, scores big in some areas and misses in others. In some ways, this is the strongest entry in the series, scoring particularly high marks in graphics and interface. The problems are a bit trickier to isolate. Essentially, the problem is making a long story short. I've been covering Her Interactive's Nancy Drew games for some time now, and this one felt the briefest. Of course, that's not always a problem, and I prefer a game that leaves me wanting more rather than one I can't wait to be over. Unfortunately, what's abridged here are some of the most charming qualities of the series--fun, well-developed characters, intrigue, and plot twists. The focus here is mostly on a series of simple mini-games, all held together with the Hawaiian theme. Her Interactive's fourteenth and latest entry in the Nancy Drew series, Danger By Design, has met with mixed reactions among fans of the series, and I'm no different. There are certainly some interesting innovations here, and I have to give Her Interactive credit for being willing to take the series in new directions and experiment with new types of gameplay. This is the first time in the series that Nancy Drew has actually fought an opponent in hand-to-hand combat. It also introduces one of the series' wackiest yet memorable characters, the masked Minette. Finally, like much of the Broken Sword series, it's set in Paris, a setting which never fails to provide amusing cultural eccentricities for the bumbling American. Overall, I must admit to being somewhat disappointed by Danger By Design, but it's nevertheless a highly playable and enjoyable game. The key problem is a couple of counter-intuitive puzzles that'll probably leave you stumped--a problem that must explain why Her Interactive decided to include "the official strategy guide" with the game. In cases like this, Her Interactive is its best competition--if we consistently compare each new game to past masterpieces like The Final Scene and The Secret of Shadow Ranch, we're raising the bar a bit high. 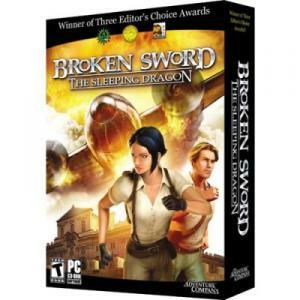 Broken Sword 3Revolution's third entry in its popular Broken Sword series, The Sleeping Dragon, released in 2003, is one of the best graphical adventure games I've played to date. The game manages to combine charismatic characters, dramatic action sequences, clever puzzles, and an intuitive interface--all into a lengthy and thoroughly engrossing game. Although I wasn't as impressed with the first Broken Sword game, I'm pleased to say that the third game is a must-have for fans of the graphic adventure. Although games have certainly come a long way since the days of Spacewar! and William Crowther's Adventure, the great bulk of these advancements have been in the realm of graphics. Games definitely look a lot more sophisticated than they ever have before. 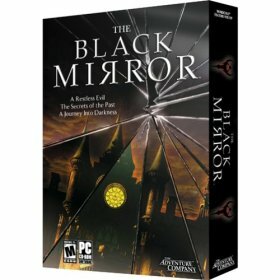 However, one area that is still painfully lacking in games is artificial intelligence, particulary regarding dialog between players and computer-controlled characters. What I intend to do here is discuss a few approaches game developers have taken to address this issue--and why sometimes less is more. If you haven't ever heard of Her Interactive, it's about damn time you did. They're the world's only--only!--developer focused squarely on the girl market, and they've been churning out amazing games based on the classic girl detective series, Nancy Drew. What I want to do here is introduce the games and talk a bit about why I think Her Interactive has been so successful. Though many people would like to pretend Her Interactive didn't exist when ranting about "the industry's failure toward women" and the like, I think it's important to look at these games and try to figure out why they're so much better than the average "girl game." When it comes to designing and developing great graphical adventure games, three names stand out far and above the rest: Ron Gilbert, Rand Miller, and Jane Jensen. I doubt they need introductions, but suffice it to say that these are the folks responsible for The Secret of Monkey Island, Myst, and Gabriel Knight--games so different from each other that it's almost ludicrous to lump them together in a single category. Gilbert's games are focused on light-hearted, satire, comic humor and Disney-like themes. The Myst games are clearly about hopelessly captivating environments, mostly surreal, and puzzles that would be at home in any Zen garden. Jensen's Gabriel Knight series, on the other hand, is about the characters and the dramatic (and supernatural) dilemmas they always find themselves in. It's about as close to an "interactive television show" as I've seen.